This is part of Iowa's capital city, Des Moines. I was born here and have lived here (West Des Moines) my whole life. 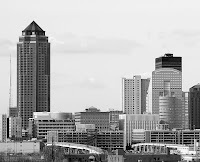 With the surrounding suburbs the population is roughly 500,000 with Des Moines proper being roughly 200,000 of that. It has a lot of big city activities, just on a smaller scale, which is fine with me. The tall building on the left is 801 Grand and is the tallest building in Iowa at 45 stories. On the top floor is a restaurant where I have on occasion tuned their piano. It's quite a view on a clear day. Very nice cityscape. The image is sharp and using B&W is a great choice. Thanks for sharing a bit of your hometown! Not what I would have anticipated Des Moines to look like, based on my (limited) experience with the Mid-West. This is a nice photo that definitely works well in black and white. You have great detail and tonal range. I'd like to see a little more contrast in the sky (I tend towards more contrasty images, though, so take with a grain of salt). This had quite an impact on me as my father worked for a company whose HQ was in Des Moines and often spoke about the city. It is not what I expected from the mid west but it is a great cityscape and nicely handled in B&W. I love it. You have captured DM brilliantly. Wow! Great details in this shot. Very crisp and sharp and the B&W works really well. Nice image, tack sharp with great tones. This is a wonderful cityscape! Sorry it has taken me a month to get here and see it :-( It's technically and aesthetically just right - nice job!